Our Bodacious Dog Mom Life: Out With The Old. In With The New. It's A Little Bittersweet. Out With The Old. In With The New. It's A Little Bittersweet. In June of 2011, I moved back to New England. At the time, I had been living out of state. In a house that was already paid for. No mortgage. A lot of people in my life during that time said I had the ultimate "white picket fence life." But, I wasn't happy. I was miserable. I wasn't where I should be. Long story short, the Universe shifted. Did a few shimmy shakes. Fate stepped in. I relinquished my rights to the house, packed a few boxes, had them shipped, and then on June 27th, I boarded a plane with my suitcase, carryon, and laptop. I was homebound. A couple of weeks prior to that date, I knew I needed to set up a simple home office to where I would be residing. Due to the many expenses of moving, I had a strict budget. I ordered a large desk and chair. Both were on sale and I utilized some online coupons. Both were delivered prior to my arrival home. Since then, the desk and chair have survived 2 moves. One from NH to CT. Then, from our old home in CT to the home we moved into back in 2012. Unfortunately, my chair broke a couple of years ago. At about that same time, my desk started to give. In addition to the 2 moves, we have moved the desk in our home office about 6 times. Back in May, when we tackled Our Big Bodacious Painting Project, we renovated the home office. Once again, the desk was moved. It was 'bout near falling apart. Both Lisa and I agreed that would be the last time. My desk couldn't survive another shift. Over the weekend, a member of our neighbor family tribe asked if we wanted a desk. She is in the process of clearing out her spare bedroom. I immediately said yes. Today, I began the process of cleaning out my old desk. I was astounded by the amount of stuff I had stored in the drawers and cupboards. I stumbled across a folder that contained a bunch of stuff from when I was in kindergarten through elementary school. 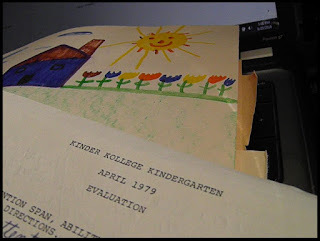 One of those items was a picture I drew and my kindergarten evaluation from back in 1979. The teacher said I was "flighty." Although I'm super excited to receive a new-to-me desk, clearing out and tearing down my old desk is a little bittersweet. But, out with the old. In with the new. I'm grateful to have a new desk.